I’m a huge seafood lover. I can’t get enough of it. Anytime my budget allows me, I totally splurge and get lobster or crab, or even shrimp! If I’m feeling really fancy, I’ll get the really big shrimp! I also really love comfort food, who doesn’t?! 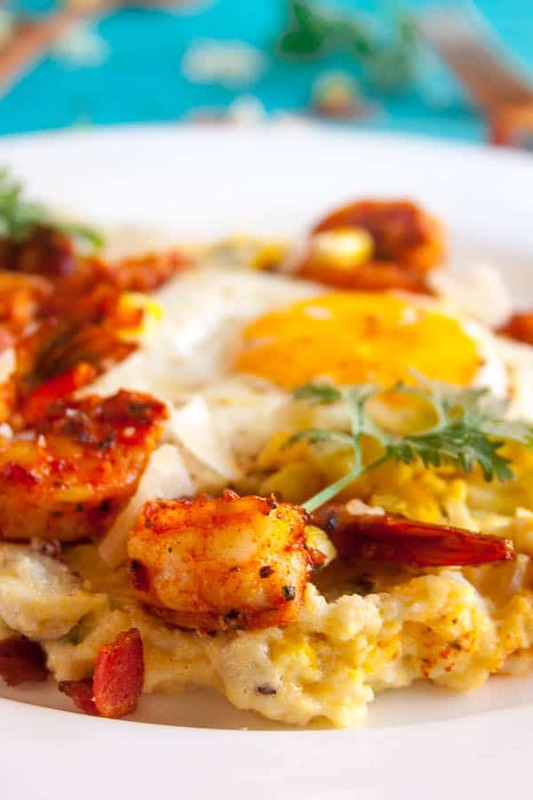 So it’s easy for me to be drawn to a classic dish like Shrimp and Grits. What’s not to love about this dish?! 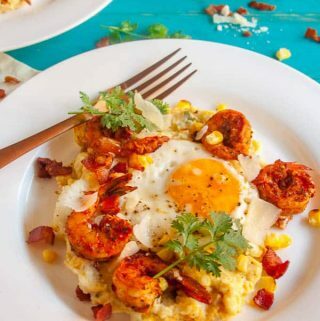 Grits are super savory and smooth and cheesy and the shrimp are just a perfect pairing. But, if you know me well, I don’t like to keep to the classics to well. I like to spice things up a bit. Starting off, I made a fantastic marinade for my shrimp to sit for a few hours, not only to get an awesome taste but to get an awesome color! I go over my no-acid rule for seafood marinades in my Mexican-Style Shrimp Scampi post (which is awesome, if I do say so myself) but I find adding some acid after the seafood has been cooked, works just as well. A tip on this marinade, tomato powder tends to clump over over time, so I just grate it with a mircoplane and I’m able to use it for this marinade. When I first tasted grits, I didn’t like them all too much. I found, though, that polenta can be a fantastic substitute for grits if you aren’t as huge of a fan as I am. I think that part of what makes this so amazing is the addition of cream to the polenta. It makes the polenta so velvety and coats the tongue so well. And cheese. Lots of parmesan cheese. Adding roasted corn and green onions really helped introduce a texture to the polenta that wasn’t distracting whatsoever and, I think, really enhanced the corny flavor of polenta. A tip to making the perfect polenta. Stir it with a wooden spoon, much like making risotto. A wooden spoon is a lot more gentle to the starch in polenta and doesn’t beat the granules up too much. And take your time, stir often. It takes about 25 minutes for perfect, silky smooth polenta, to be finished cooking. 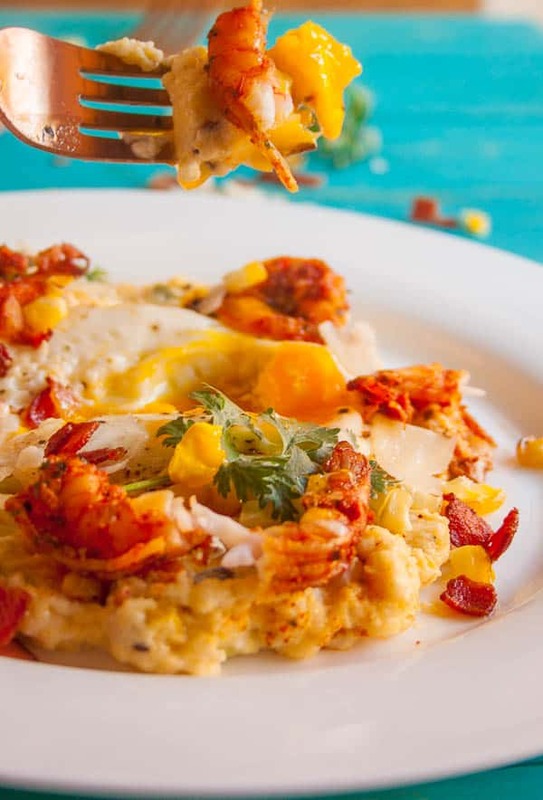 You can stop at just the shrimp and creamy polenta if you so desire. But nothing is more complete than a dish topped with a fried egg. Especially if there’s bacon involved (oh there is). 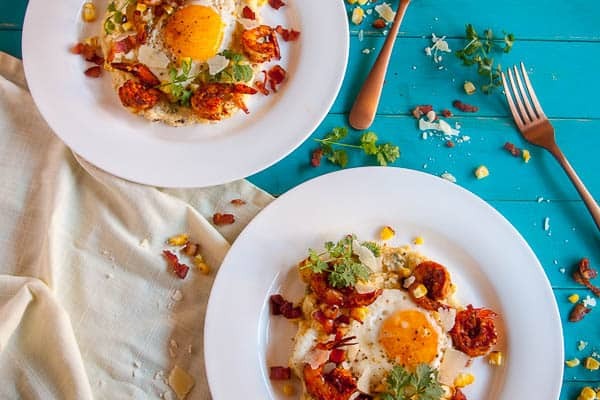 This dish is probably the best bridge of breakfast and dinner… or brinner! Mix all marinade ingredients together, until well combined. Add shrimp and coat well. Allow to marinade for at least 30 minutes. Preheat oven to broil and line a sheet pan with parchment paper. Dress onions and corn with olive oil and season with salt and pepper. Place sheet pan in oven and toast green onions until charred, about 5 minutes, turning each one over at 2 minutes. Continue to broil corn until tender, about 20 minutes total. Once the corn is tender and cool enough to handle, cut kernels off of the cob and cut up the green onion. Bring a medium skillet to heat and render bacon until crispy. Drain and set aside. Bring a 4 cup sauce pot to heat over medium heat. Add a touch of oil and saute shallot and garlic until translucent, about 4 minutes. Add polenta and toast for about 2 minutes, stirring constantly. Add the cream and milk to polenta and stir frequently, making sure to remove polenta from edges and bottom of the pot. Keep stirring until polenta is thick, smooth, and creamy. Add in parmesan, corn, green onions and bacon (set some bacon aside for garnish). Adjust seasoning. Bring a medium sized skillet to heat over medium high heat. Heat a touch of olive oil in the pan and cook the shrimp, about 3 minutes total and flipping shrimp when pink. Remove from heat and reserve on a paper towel lined plate. Bring an egg pan to heat over medium heat and add eggs. Season with salt and pepper and cook until desired doneness. 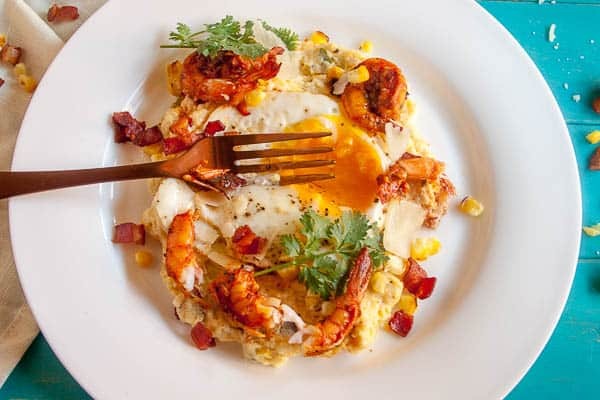 To plate, place creamy polenta on the bottom, top with shrimp and fried egg. Garnish with crispy bacon, shaved bacon, and cilantro leaves.